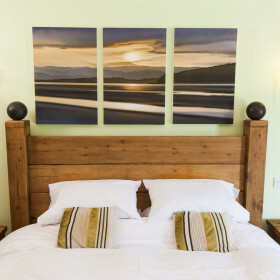 Between the peaks of Snowdonia and the breezy, cheery beaches of North Wales sits The Lodge. 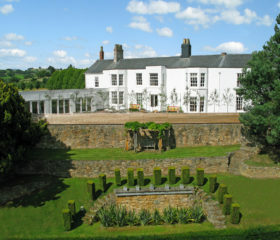 Phone the electronic gates open, goggle at the gardens, break open a Beaujolais on the terrace. 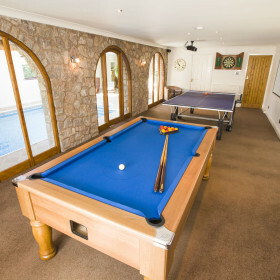 Dive into the indoor heated pool, magic up a movie night or play ping-pong and pool. 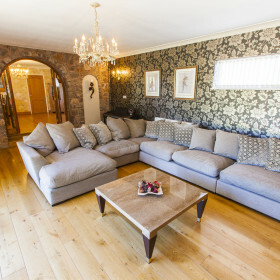 In North Wales, settled between Chester and the soaring peaks of Snowdonia, sits The Lodge. Phone ahead to open the electronic gates, then goggle at the gardens and views. 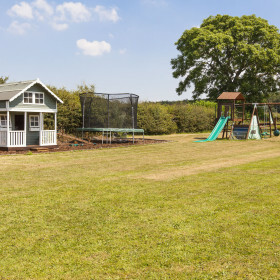 As the kids explore the swings and slides, footie nets and trampoline, you can explore a claret on the terrace or in the hot-tub complete with surround-sound. 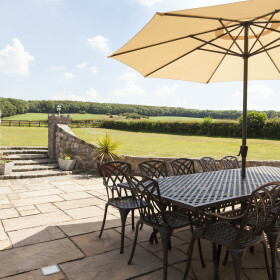 You can eat al fresco, too, with meals prepared by you amid the bespoke oak of our kitchen, or by our chefs. Alternatively, delve into drop-off meals or tackle a takeaway. 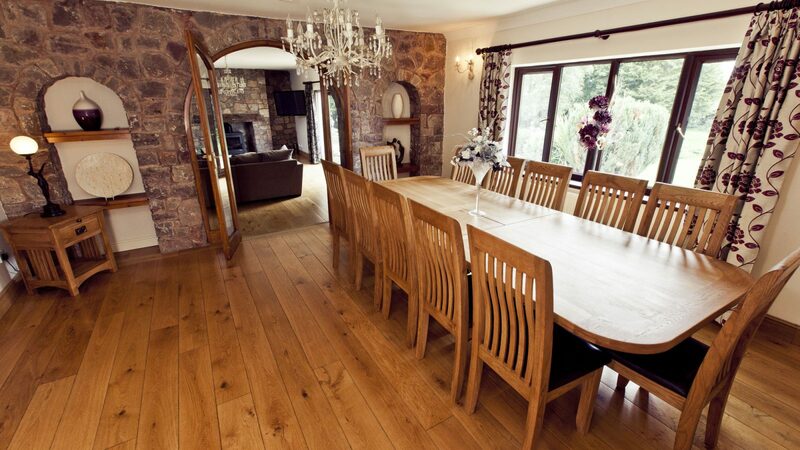 Celebrate together around the huge dining table. 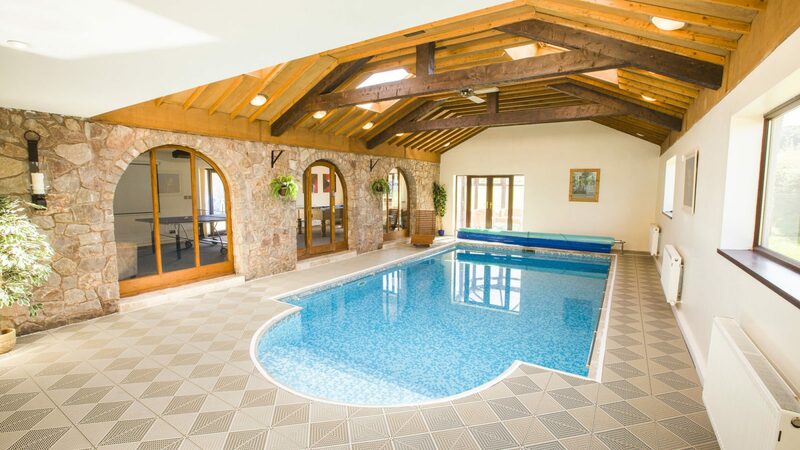 Make a splash in the indoor heated pool and hot-tub. 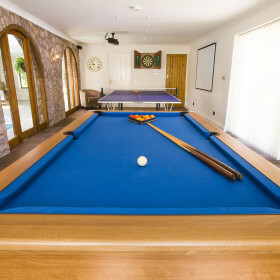 There’s further fun to be had with movie nights in the home cinema, and ping-pong and pool in the games room. 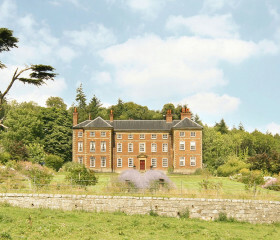 There’s wifi for keeping in touch, Playstation 3, two Sky packages and smart TV in the eight bedrooms. 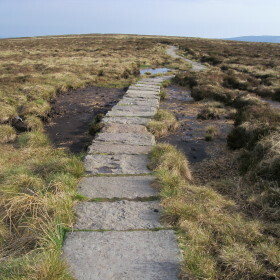 The pubs invite a short walk. 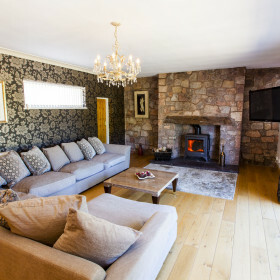 The comfy couch and woodburner suggest a page-turner. The Lodge is where homely and hearty get wired for fun. The gardens sprawl forever through acres of farmland and woods. But don’t goggle and gawp – get out onto the 400-square-metre Indian stone patio for drinks and dinner. If the clouds part, the conservatory’s on standby. 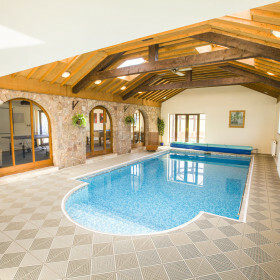 Enjoy the fun in the indoor heated swimming pool. The kicks even continue in the luxury wet room with twin showers, basin and WC. 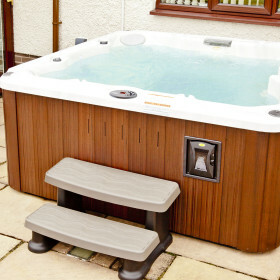 Outside, the six-seater Jacuzzi hot-tub awaits for bubbles and bubbly. Push the right buttons for the waterfall function, waterproof iPod dock and Bluetooth sound system. With interior living spaces like this, you’ll be doing a rain dance. 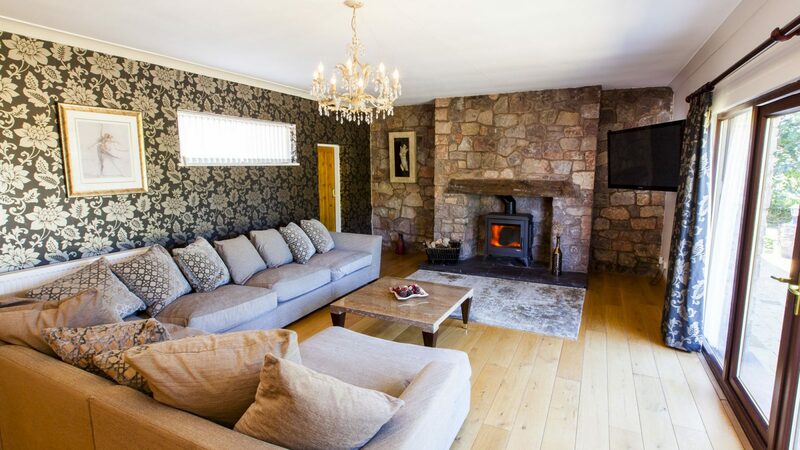 Chill by the roaring fire; crash out on the world’s most comfy couch. If the clouds do part, fling open the French doors onto the front garden, fire up the electric heated awning and pop a cork in the Welsh mist. Indoors, the 51” TV and two full Sky packages – one in each lounge – are perfect for time out from your celebration or holiday. 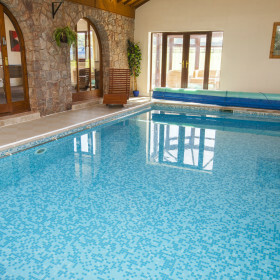 Liven it up with a splash in the heated indoor pool or with ping-pong and pool in the games room. You can do your ablutions in absolute luxury in travertine-tiled bathrooms, with a deep tub for long soaks. And when you finish off your swim in the wet room, you might never emerge. You’ll be beguiled by the subtle lighting and the Hudson Reed showers, and willingly battered by the water jets. Eat in, eat out. 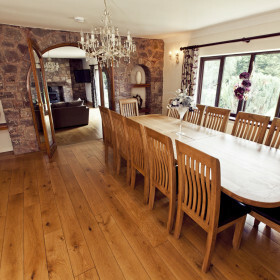 Whatever your preference, it’s a pleasure at The Lodge. 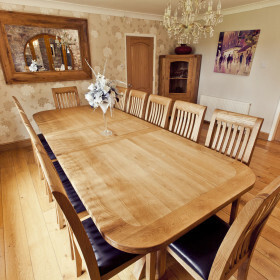 Extend the oak dining table and eat like royalty, with younger ones on a separate table for princes and princesses. This is where you can get everyone together, in spacious and social comfort, to talk about today and make plans for tomorrow. 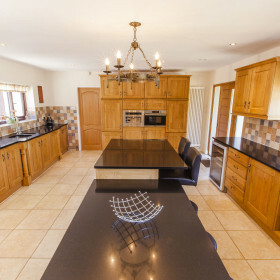 Cook at home in the massive kitchen. 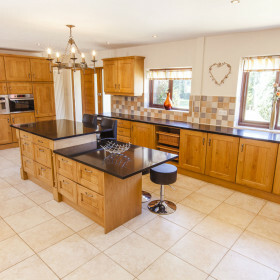 The bespoke timber wall and base units, granite worktops, American-style fridge-freezer, dishwasher, wine chiller, ice machine and filtered boiling water tap make it a pleasure. 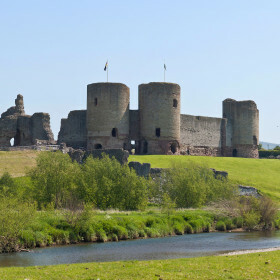 If you’d prefer to take the heat off, then just whistle and our chef will be over to rustle up a masterpiece from ingredients fresh from the abundant fields, streams and farms of Flintshire. We’ll even load the dishwasher. The Lodge is an exercise in opulence and finery, and North Wales is a vista of soaring peaks, tumbling waterfalls and breezy beaches, but we’ll forgive you if you never emerge from the lavishly appointed bedrooms. In bedroom one, the backdrop is the meadow, the options are two single or one double, and the soundtrack comes out of an Airplay sound dock. Bedroom two will have the kids squabbling over the top bunk. 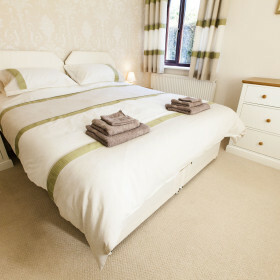 In bedroom three, choose from a double bed or two singles and stay up late watching the smart TV. Sssh, don’t tell mum and dad. 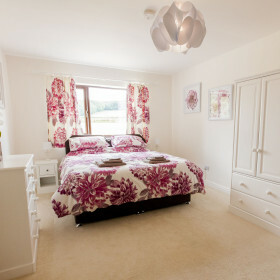 Bedroom 4 is a large master that comes with super-king ‘cannonball’ bed and en-suite shower/WC. Open up the double doors and take your eggs sunny side up on the patio in the morning sunshine. Entertainment comes care of the wall-mounted TV and Airplay music. 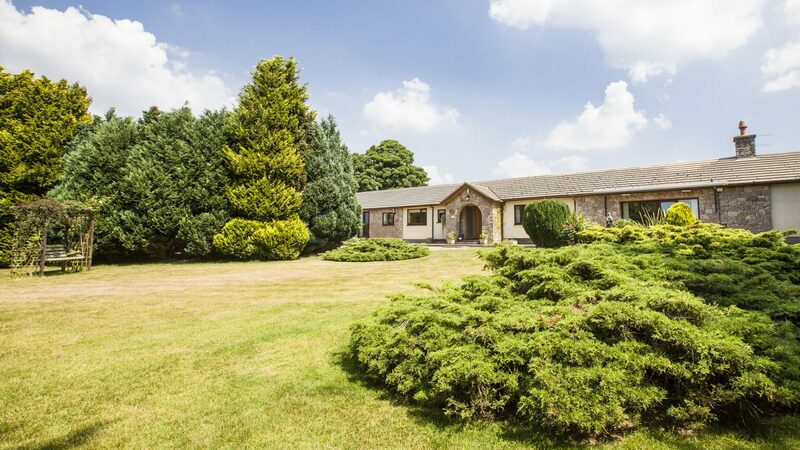 Bedroom five offers en-suite shower/WC and a smart TV, bedroom six is teen central, with TV, single bed ands spare ‘trundle’ bed, and bedroom seven comes with a choice of double or two singles in an object lesson in elegance. Bedroom eight is another magical master suite. 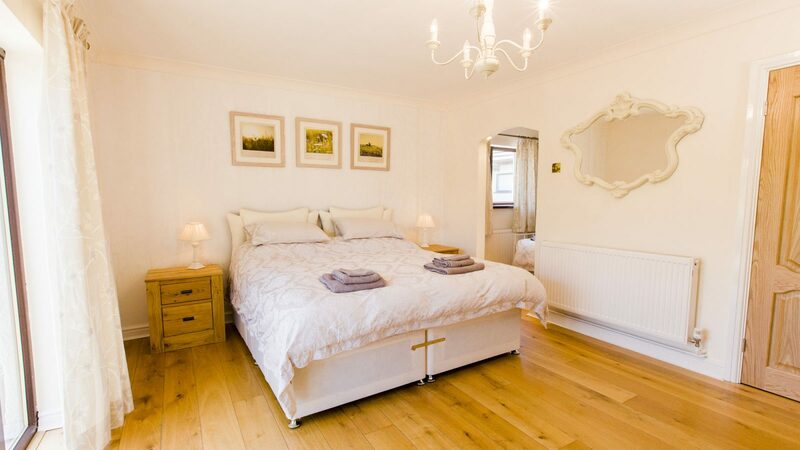 Sleep deeply in the super-king bed or two singles, with space for junior in a spare day bed. 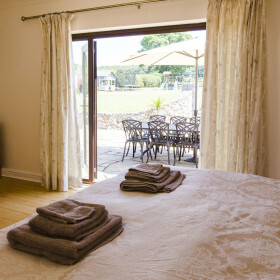 Warm your toes with underfloor heating in the en-suite and come alive in the walk-in shower. Fling open the patio doors for al-fresco croissants and coffee. 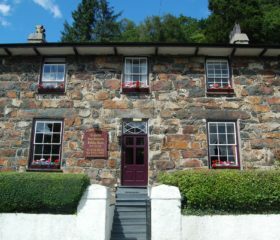 In the quiet, quaint charm of North Wales, there’s something different at every turn. 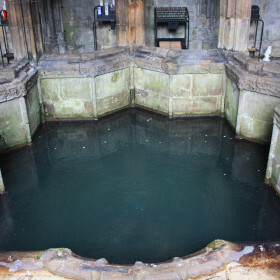 Climb to the Roman watchtower for 360-degree views, see St Winefride's Well, one of Wales’ Seven Wonders, or walk Offa’s Dyke Pathway. 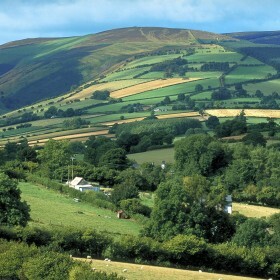 Tuck into a banquet at Ruthin Castle or feast your eyes on the peaks of Snowdonia. 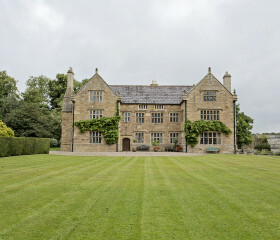 Secluded Jacobean party palace set in a huge slice of Wales.